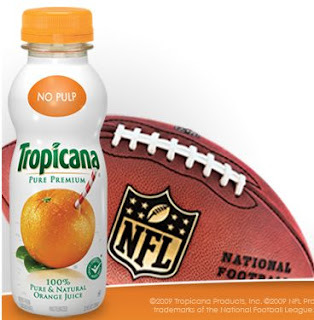 Enter everyday for another chance to win instant NFL prizes or a trip to Super Bowl XLIV. Plus, save 15% at NFLShop.com when you use code JUICE at checkout. Eligibility: Open only to legal residents of the 50 United States and the District of Columbia who are 18 years of age or older as of September 1, 2009. (A) TEXT MESSAGE: To participate by text messaging, text FOOTBALL to shortcode TROPOJ (876765). For each text sent, you will receive one (1) entry into the random drawing for a chance to win the Grand Prize AND one (1) “play” for a chance to win an Instant-Win Prize. Entry Limit: one (1) Entry/Play per person/mobile phone number/email address per day, regardless of participation method. Prize Limit: one (1) Instant-Win Prize per person/mobile phone number/email address/household during the Sweepstakes Period. Grand Prize Drawing: The Grand Prize Winner will be selected in a random drawing on or about January 4, 2010 from all eligible entries received. Grand Prize winner will be notified by phone on or about January 5, 2010. I won a cooler. SWEET! I just one a cooler! Yahoo! lovetowatchgreenbay(JamieH) in chatrrom just won a Green Bay Packer cooler!!!!!!!!!!!!!! I won the October prize – 4 NFL cups! Won the set of cups! Won a set of cups late last night online! Thanks! Just won the NFL Helmet!! I won a cooler, but apparently it was from the "unclaimed prize" drawing. I got an email with prize info on October 21st. Just wanted to let everybody know to check their junk mail folder just in case they, too, were selected. 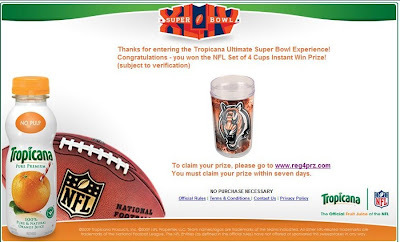 The email title was "Tropicana NFL Sweepstakes". Thanks for all the great info, Sweetie. It's so fun to win! I just won the NFL Helmet. Thanks. I won the mini NFL helmet today! First Instant Win game I've won in a while. Persistance pays off! Hubby got an email last nite that he won a mini NFL helmet from the drawing for unawarded prizes. I won an nfl car flag last day of contest yeah !